It isn’t against the law to vape anywhere in the UK. Since July 2007, there have been laws about where it’s legal for you to smoke, but the government hasn’t extended these laws to cover vaping, because electronic cigarettes do not burn anything and don’t produce any second-hand smoke. So does that mean you have a right to vape wherever you like? The simple answer is- no, you don’t. Check with staff before you start vaping in bars or other public settings. Although you may be allowed to legally vape indoors, this ultimately falls down to whether the management allow it in their establishment. 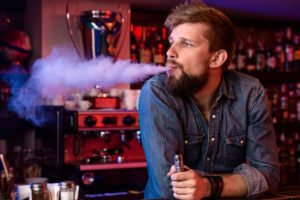 Don’t cloud-chase in public places- even if you are in a bar or pub that allows vaping, it isn’t a good idea to show off by blowing clouds of vapour. If the pub is busy, somebody is bound to complain and that might then lead to a total vaping ban. Even if you’re walking outdoors, people will rightly object if they suddenly have to walk through a thick cloud of custard scented vapour- I know that I would and I enjoy custard e-liquid! People do expect to see a moderately sized cloud from an e-cig though and the majority probably aren’t too bothered by it, but do be considerate towards others. Don’t vape in places where it will disturb others, such as the cinema or in restaurants. No one wants plumes of vapour blown into their faces when they’re trying to enjoy a nice meal or watch a movie. Respect vaping laws in places like aircraft and trains. Although you might be able to get away with stealth vaping or nipping into a toilet cubicle at work, sensitive smoke alarms fitted in aircraft toilets and on trains can be triggered by e-cig vapour, and I’m sure you don’t want to be responsible for creating a false fire alarm, which is also likely to get you fined and blacklisted by the airline.